Kayla’s passion is science, and she’s also good at math – which made the Just-A-Start Biomedical Careers Program a perfect fit for her. She had started her college education at Framingham State College as a biology major, with the hope of becoming a wildlife biologist. She transferred to Bunker Hill Community College but had to stop attending because her financial aid did not cover enough of her educational expenses. 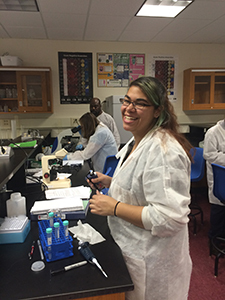 When she learned about the Biomedical Careers Program, she knew this was the right program for her. Kayla’s hope is to get a job as a lab technician or an animal care technician, and then pursue opportunities to grow professionally at the company that hires her and, hopefully, go back to college to finish her degree. Kayla graduated from the Biomedical Careers Program on Tuesday, May 17, 2016 and is actively job hunting.